Today Penelope went for a trip to the River Rhine, a river that I’ve cycled along on my Trice Q and on Alfie many times but this was Penelope’s first visit (as far as I am aware). Today is Easter Saturday. However, yesterday Penelope also got to stretch her legs (metaphorically!) 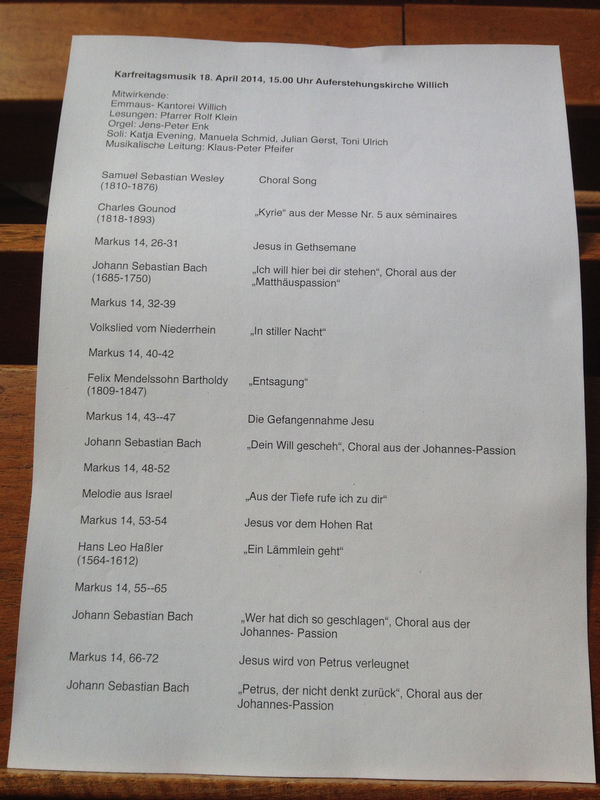 as we went to Willich to a Good Friday (Karfreitag) concert. 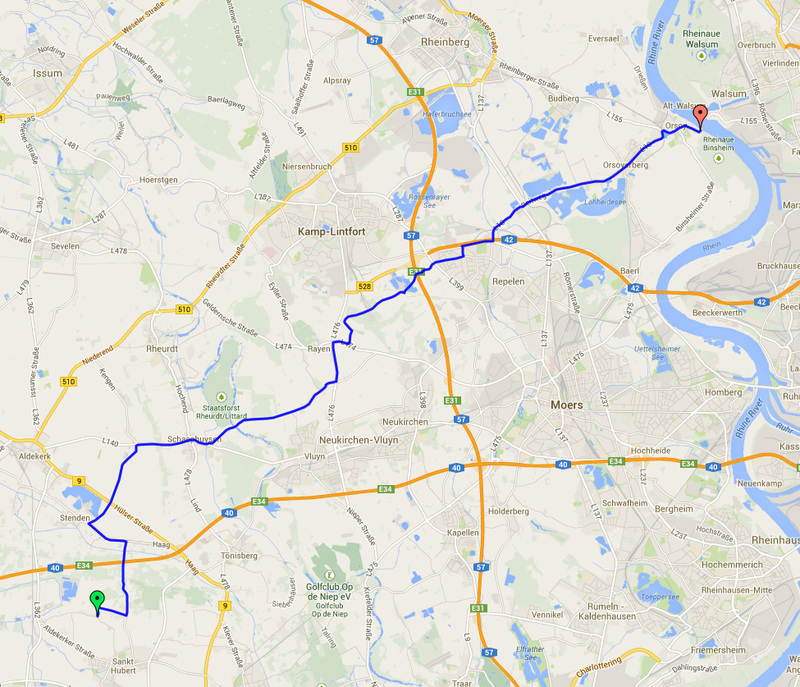 Willich is 12.5 miles away and I chose routes there and back (which different slightly) which were pretty much entirely Landstraßen – these are the long, fast roads with cycle paths alongside. This is the ideal sort of route for Penelope – she’s not at her best doing lots of stopping and starting but when she gets up to speed she keeps on going. 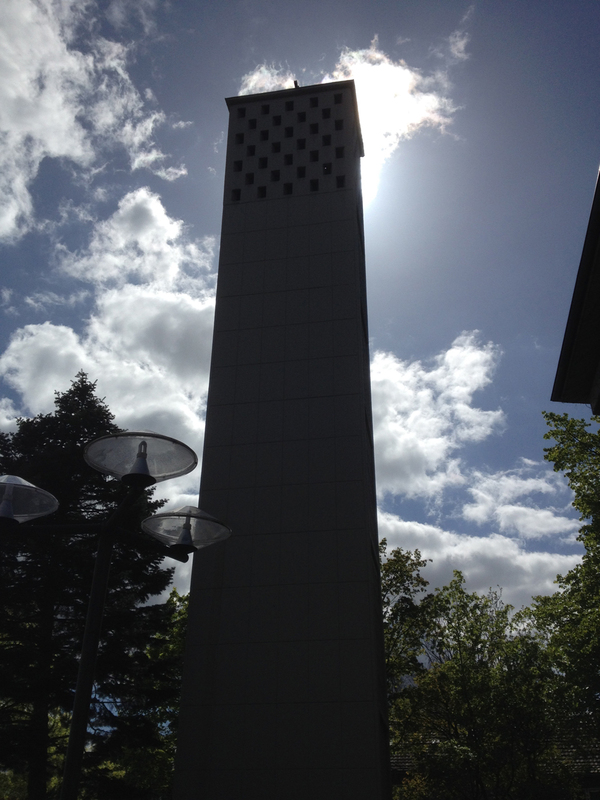 I arrived at the Auferstehungskirche in Willich rather early – 40 minutes early, in fact. This is because I’d cycled at an average of 13mph to get there, much faster than I would go in Alfie. I had a slight tailwind to assist as well. I locked Penelope up in the bike racks and then sat outside for a while, listening to the choir practising. Lots of people were arriving so I decided to go inside and get a good seat – which I did. This is the choir practising. 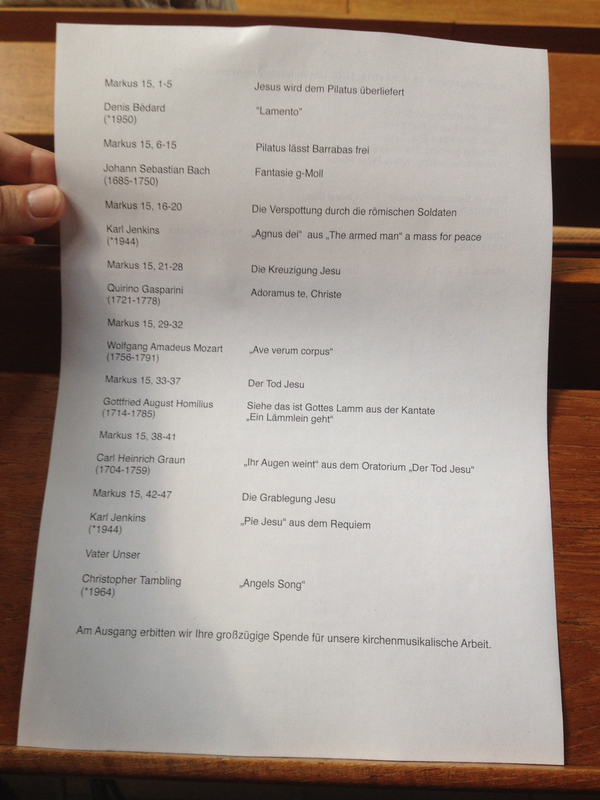 And this was the selection of music and readings for the concert – some wonderful choices! 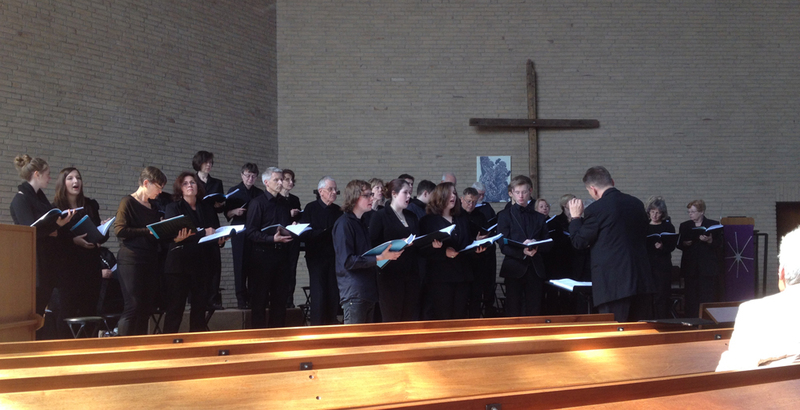 The choir is effectively the church choir for a group of three churches in Willich/Neersen/Schiefbahn and they sang fairly well. The organist was good too. Afterwards I bumped into Anja and her husband Lars (Anja is the lady who introduced me to the Willich choir) and we had a little chat about the music. She said that the choir has really improved over the last few years – certainly there were some pretty good young soloists, two young girls in particular sang beautifully. I cycled back the slightly alternative route which worked out at about four tenths of a mile longer but slightly faffier, particularly as it went through Tönisvorst which involved a fair few traffic light crossings. I deviated on the route back into St Hubert, choosing to go a rather longer route in so I could cycle along the high street and see what was open for food (being a bank holiday I wasn’t sure if any take-aways would be open). The town of St Hubert wished me a very friendly Happy Easter. I was able to find the local kebab shop which was open and I ordered myself a Schnitzel and Pommes (chips). I bumped into Frank the landlord there so it was clearly going to be kebab night in our house. 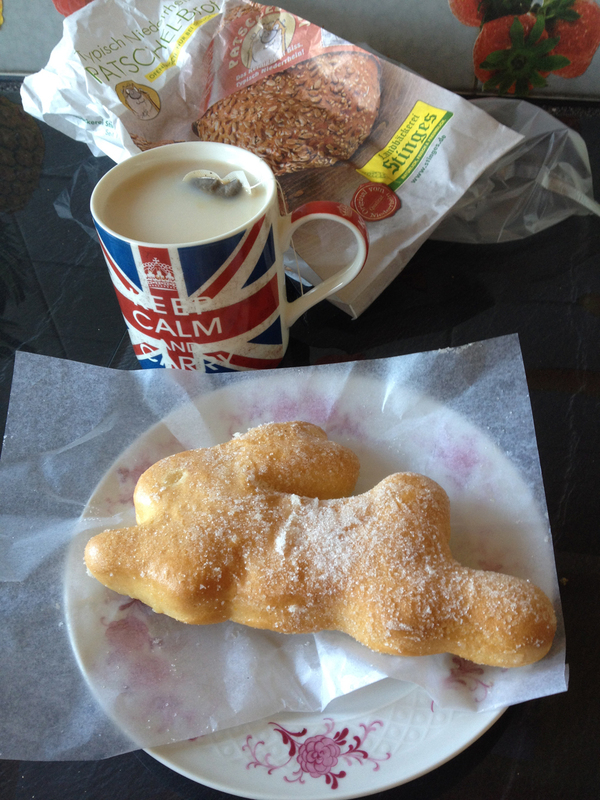 When I got in, after my 24.66 mile ride (at an average of 12.4mph) I also treated myself to an Easter Hare doughnut thingie. 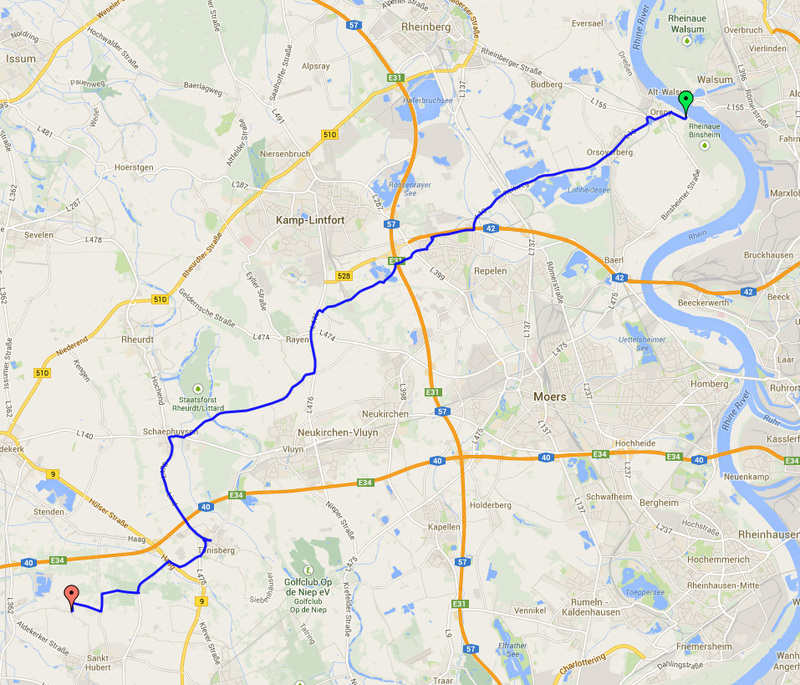 So that was yesterday, an enjoyable Karfreitagskonzert and a good leg-stretching run on Penelope, my fastest trip yet. On Thursday I had a message from my German friend Olaf who lives in London. He said that he was cycling from the Hook of Holland to near Dortmund and would be passing 20 miles or so from Kempen – would I like us to meet up. 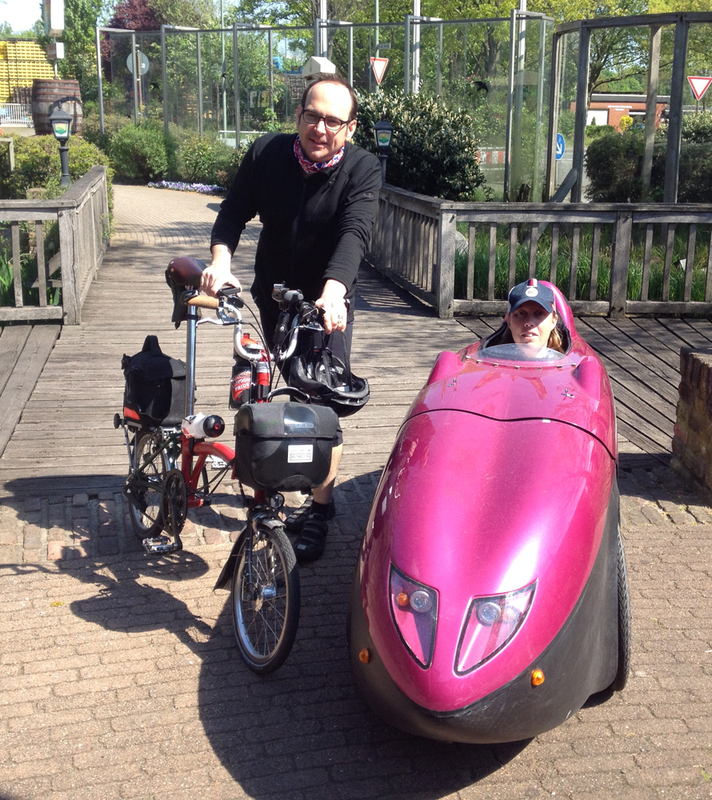 Of course I jumped at the opportunity, it’s always good to see Olaf (I first met him when cycling overnight from London to Southend – he was on a German recumbent bike but has now gone native and has several Brompton folding bikes and a Moulton). Olaf works for Reuters as an economics journalist – if you’d like to read his English language blog the link is here: Economics Intelligence (there is also a link to a German language option as well). Anyway, Olaf said he would be crossing the Rhine at a place called Orsoy and perhaps we should meet there. My maps seemed not to have Orsoy but eventually Olaf sent me a link to where it was and we agreed to meet at about 1pm on Saturday (today). This would be my longest ride in Penelope in a day, and I was aware that I had done another longish ride on her the day before, so this would be a test of my knees. 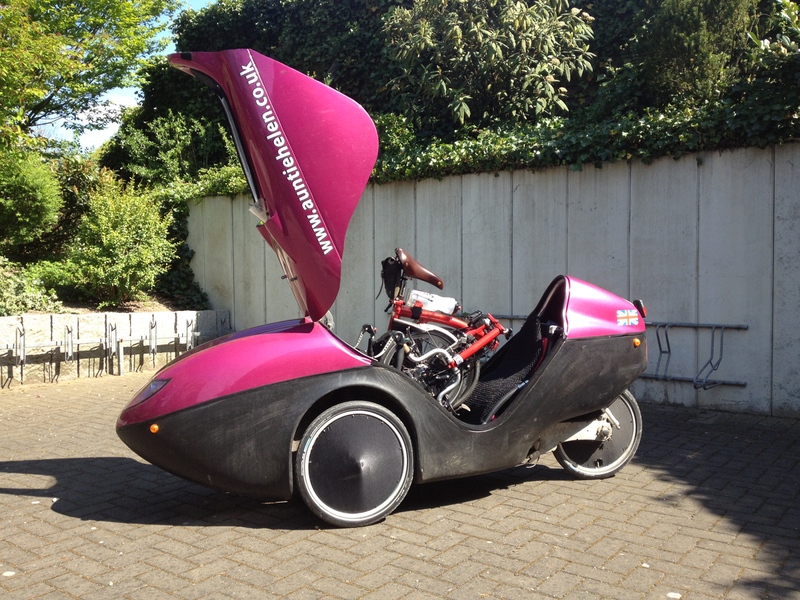 Olaf sent me a message this morning to say he was making good time and could we meet at 12:30 so I headed off pretty smartly, knowing it was a warm day so wearing just a sleeveless top and shorts in the velomobile. My outward and return routes were virtually the same – this is the outward route to Orsoy. 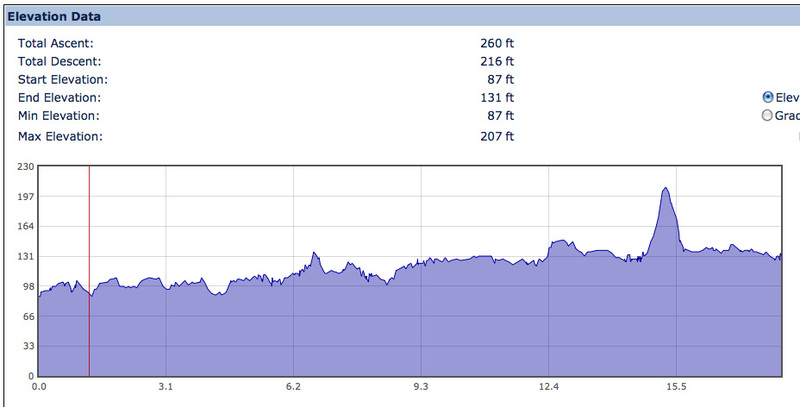 This is the elevation profile of my outward journey – as you can see, I wasn’t able to miss the moraine/hill that Tönisberg sits on entirely – this time I had to go over the bump at Saelhuysen. It was quite steep but I survived it! From Saelhuysen I rode on reasonable cycle paths uphill to Schaephuysen and then skirted north of Neukirchen-Vluyn before hopping briefly onto the L476 northwards. 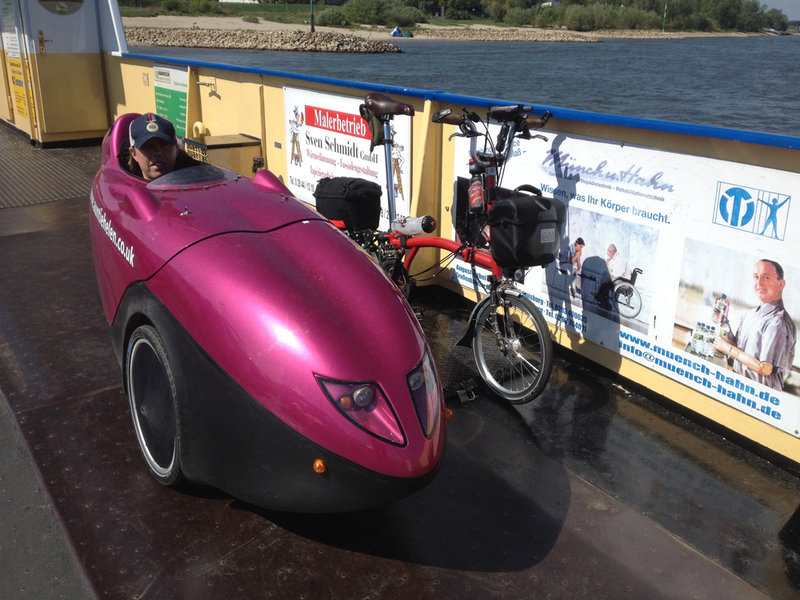 This road was one of those without a cycle path but with a hard shoulder instead – these are pretty good in a velomobile! I did a slightly pointless detour to get onto a quiet track – I could see that there was a much more direct route continuing on the L476 so I decided to use that option on the way back (and I did). I was now heading towards Kamp-Lintfort but turned off and had to go up high to pass some lakes and then descended again before crossing under the A42/A57 motorway junction. I would have enjoyed the downhill more if the road had been a bit smoother but it was somewhat bumpy so I took it carefully. After this I cycled through Repelen before crossing under the A42 again and then having a quick scramble to cross a fairly main road, the L137 Rheinberger Straße. I then had a very enjoyable ride through quiet roads past several large lakes which were called Baggersee (this is the name for a gravel pit lake). 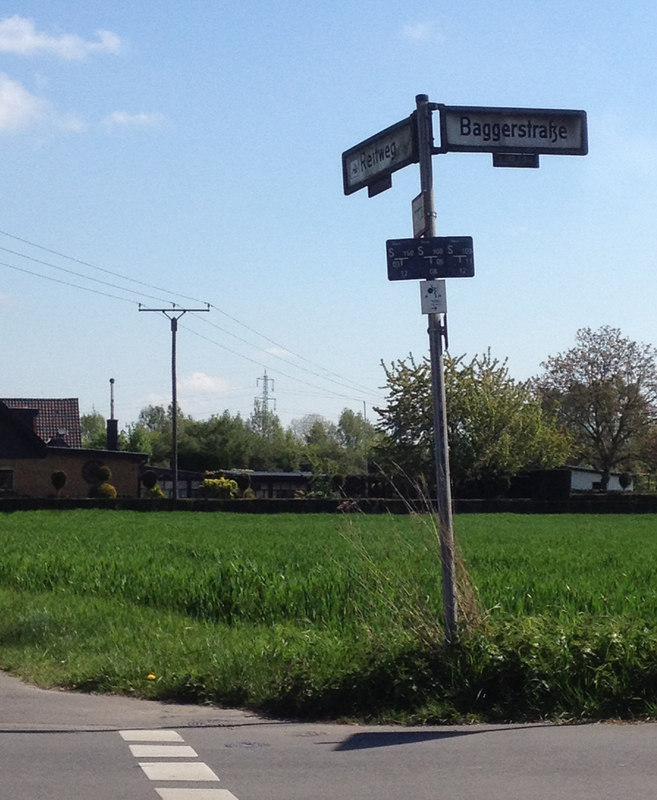 I had to stop to photograph this road name as I used to cycle a lot in the UK with a friend whose nickname is Wowbagger. He has a road named after him! The kilometres to Orsoy were counting down rapidly and I was slightly ahead of schedule which was good. 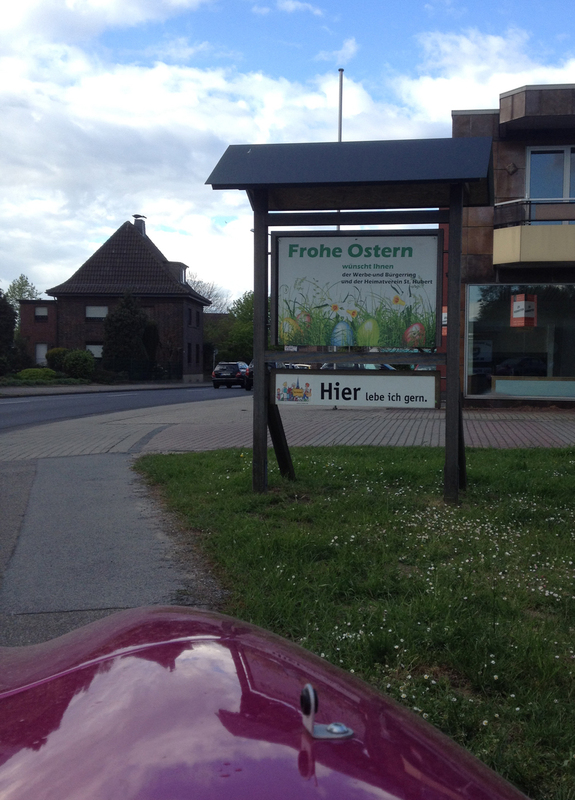 I rode through Lohnmühle and then arrived in Orsoy, following my Garmin’s track to the river Rhine. Olaf and I had agreed to meet at the ferry across the river and get something to eat on the other side. I have to say, the view directly across wasn’t the most attractive Rhine view I’ve seen this year. 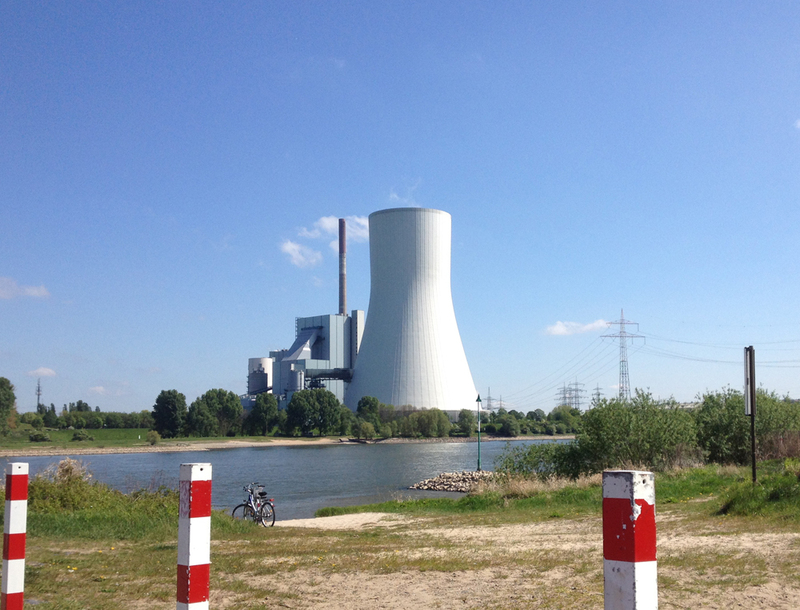 This is the Walsum Power Plant. I was ten minutes early and parked Penelope in the waiting area for the ferry (which was on the other side of the river). Just three minutes later I saw someone cycling my way on a Brompton – it could only be Olaf! 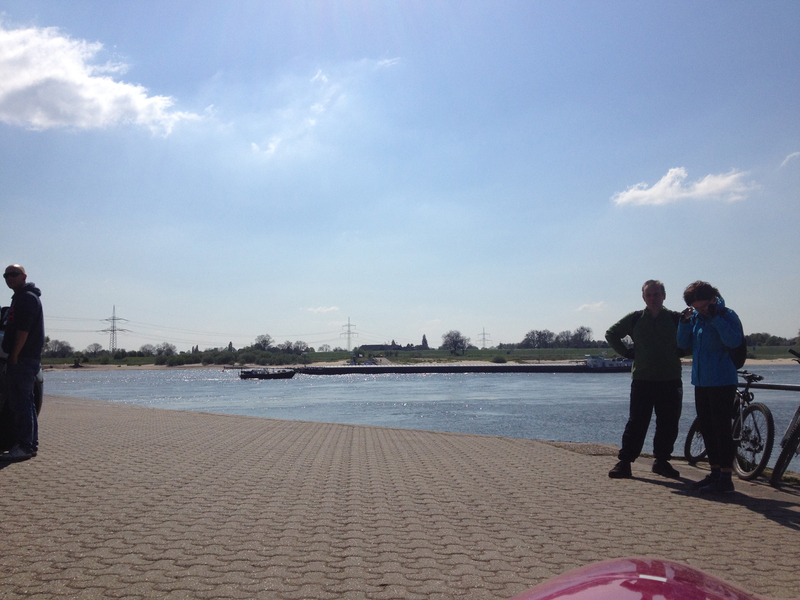 We said a quick hello and then hopped onto the ferry to cross Vaterrhein. The other side had a VERY steep slope and I wasn’t sure if I would make it but fortunately I did – I was just about able to winch myself up. The plan was to head for the Walsumer Hof fish restaurant which was just 200 metres or so from the ferry but when we got there it was closed. 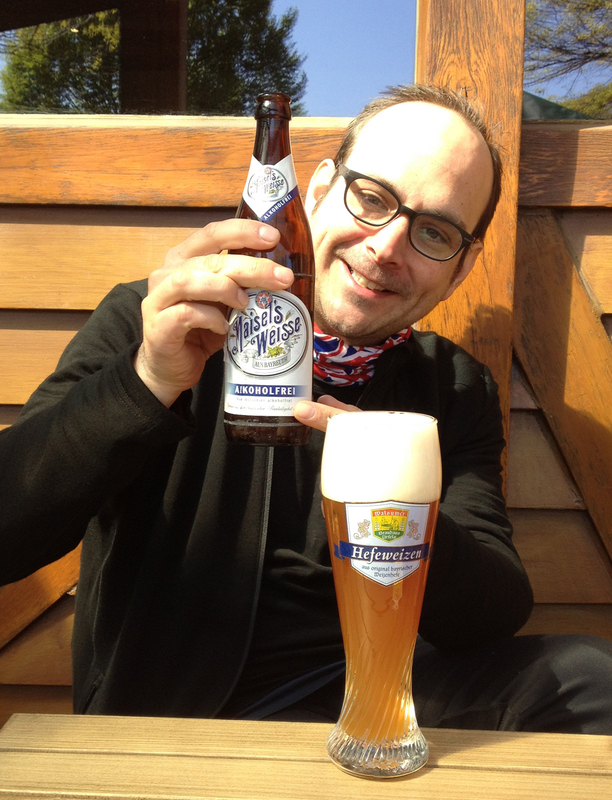 Our Garmins suggested we tried the Walsumer Brauhaus 1.5km away so we headed off there. 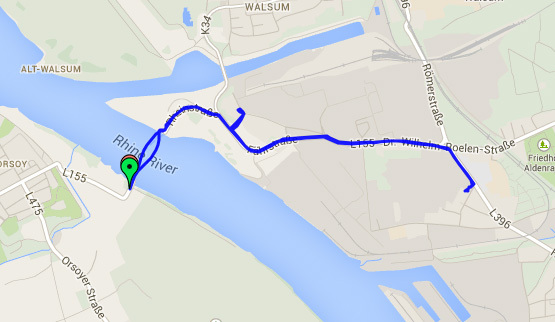 This is the track from the ferry waiting area to the Walsumer Brauhaus and then my return track back across the Rhine. We arrived at the Walsumer Brauhaus which fortunately was open. It turned out to be an excellently typical example of this kind of German beer/food establishment (I guess not entirely unlike a Harvester in the UK). Olaf had leaned his Brompton against the wall beside our seats – and a staff member came out and asked him to move it to the bicycle parking area. He commented that he didn’t have a lock so wanted to keep it in view. She harrumphed but let him get away with it. We were the only two people sitting outside in a very large area at that time so the Brommie was doing nobody any harm. 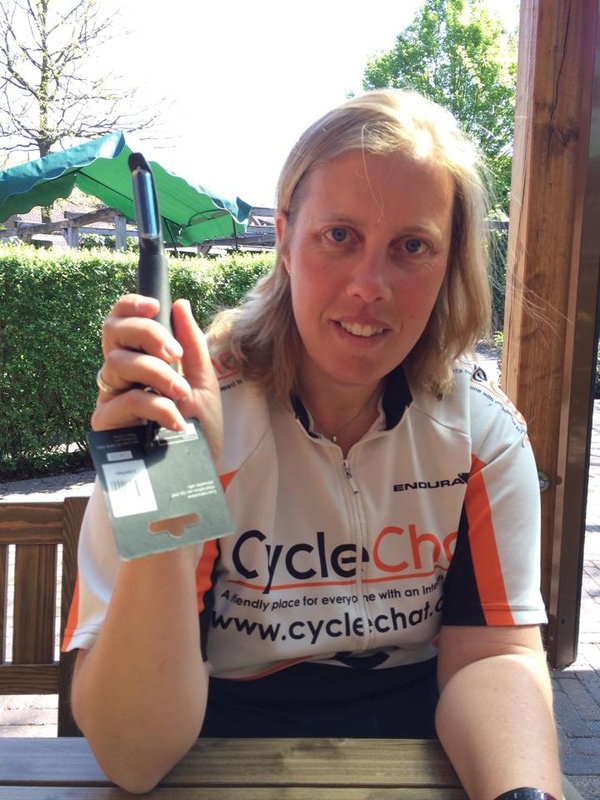 And then Olaf rummaged around in his pannier for a moment and then presented me with… a potato peeler! This is not as random as it seems. I had discovered, since arriving here, that there are no end of Spargel Schäler (asparagus peelers) – indeed, there are three in my cutlery drawer here – but that I find them hopeless for potato peeling. They seem to have the blades on the other way round or something. I had very limited success spending ages peeling a potato with a Spargelschäler and then looked in several supermarkets/kitchen shops for a proper swivel potato peeler – without success. Lara, who lives downstairs, is currently in England and had offered to see if she could find one for me but my joking comment to Olaf (to bring one with him from London) unexpectedly bore fruit. He said he was short of time and wasn’t planning to get one but the way I had phrased my request to him (“not having a potato peeler is doing my head in”) worked on him suitably so he popped into John Lewis and got me one. I then texted Lara to say no need for her to get one, Olaf had sorted it. He commented on Facebook: “Helen’s potato peeling crisis has been sorted once and for all!” He was right, too. 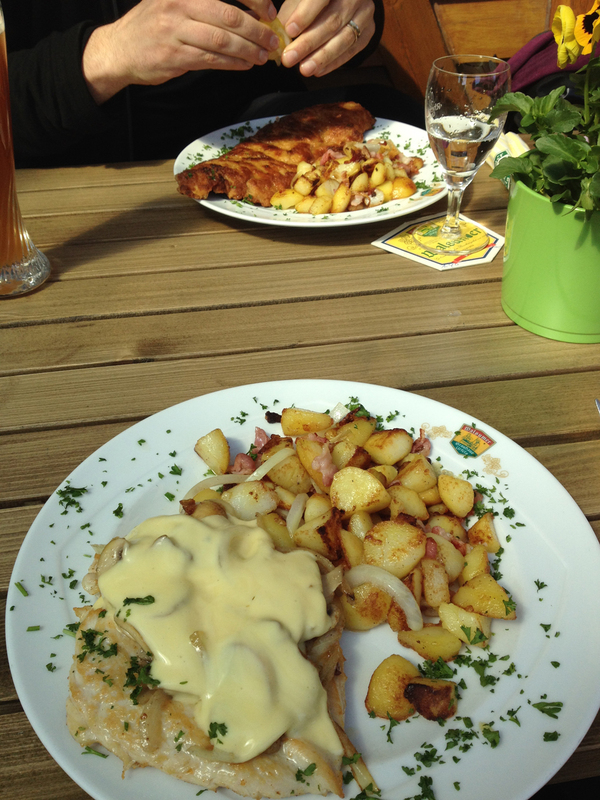 Soon our traditional German lunches arrived – I had a chicken thing with mushrooms and healthy German roast potatoes (with lots of salt and bacon), Olaf had a Schnitzel. After lunch it was time for our hot drinks. I had a cup of tea (with my own teabag of course) and Olaf had to order a full Kännchen of coffee (because we were sitting outside). 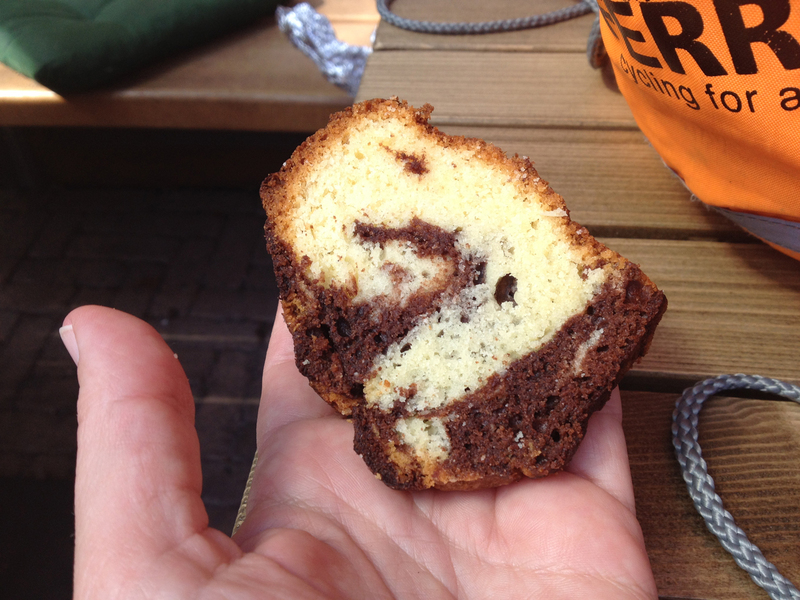 This irked him enough that he decided that rather than waiting till we left the café before he shared the cake his wife had made, we would surreptitiously eat it whilst drinking our tea and coffee. 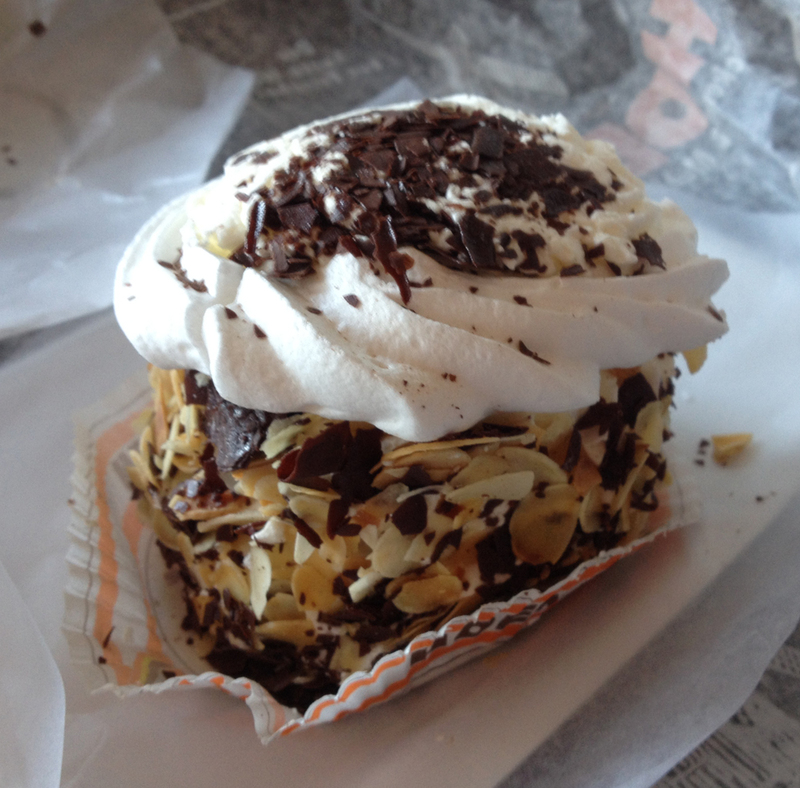 So he handed me a slice and I held it under the table when the waitress arrived. I was interested that Olaf has ‘gone native’ a bit in England and had learned to park his bike where it shouldn’t be parked and import cake to a restaurant. He probably crosses on the red man now as well. After food it was time for our bikes to properly meet each other. Here is Olaf’s Brompton getting up close and personal with Penelope. 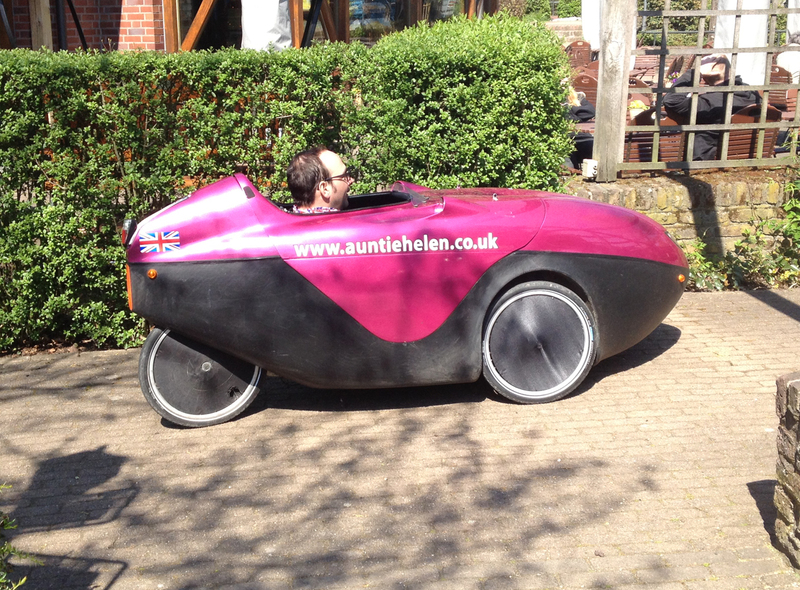 We had hoped to be able to shut the lid of Penelope to make a Russian Doll-type bicycle arrangement but my Garmin mount (over which I have long laboured to get it fixed) was in the way – I wasn’t removing that! Olaf had another 50km to ride, I had 30km back to Kempen, so at 2:30pm it was time to set off on our respective journeys. We got another of the diners to take a photo of us together. I waved goodbye to Olaf on his Brompton, which has carried him safely from the Hook of Holland yesterday across the entirety of the Netherlands and a goodly chunk of Nordrhein-Westfalen too, and I headed back to the ferry. Here’s the view as I waited for the ferry again. 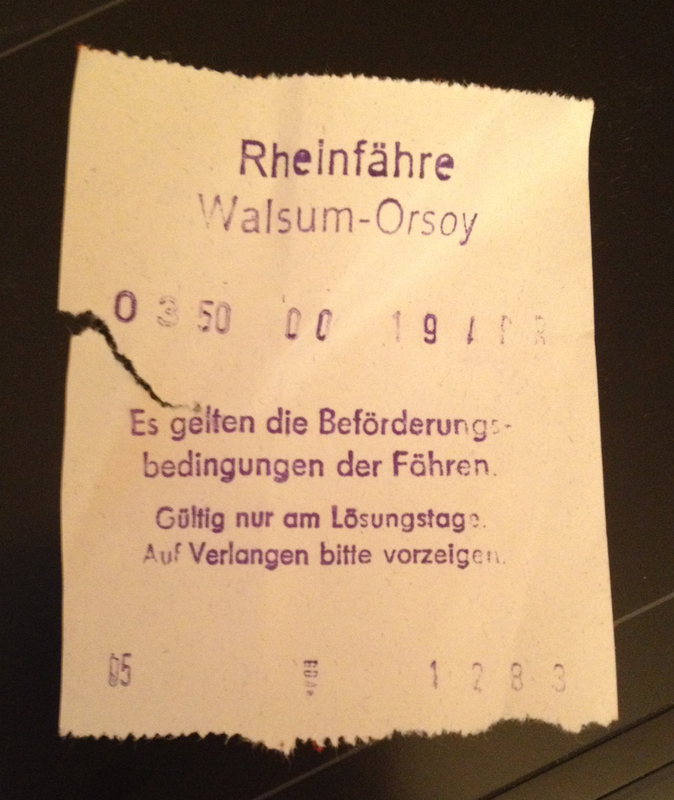 I had bought a return ticket (saved myself 50 cents on two singles). This is the track of my return journey – it’s mostly the same as the outward journey except I went through Tönisberg rather than Stenden. 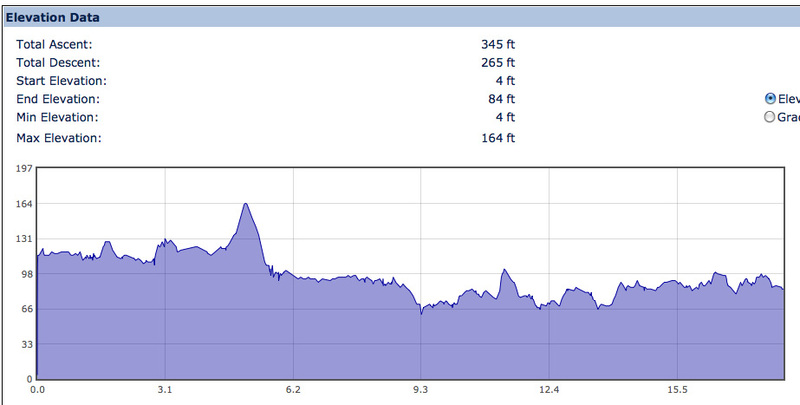 And here is the return journey elevation. 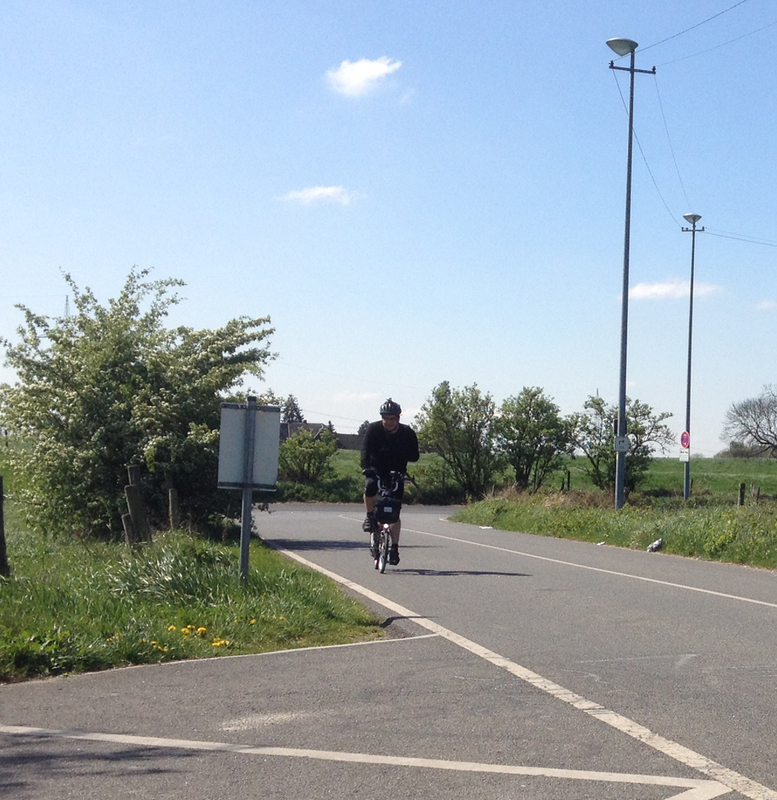 I rode more of the journey home on the roads (rather than cycle paths) as there was so little traffic about today. The tailwind also helped a lot and my return leg was ridden at an average of 13.2mph. I did a slight route variation in Repeln (I was daydreaming and not paying attention to my Garmin and so overshot a turning) which involved taking a shortcut through a cycle route – which turned out to be yet another route with double gates. 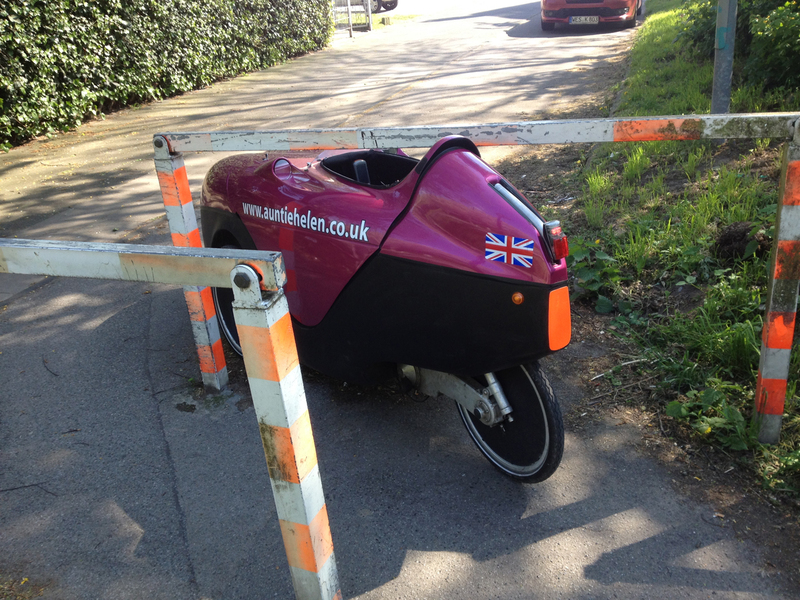 These were too narrow for me to ride around so I thought I’d try underneath. The front half of Penelope fitted but it was clear the rear was too high! Alfie fits under that sort of gate OK – he is a fair bit lower! I routed via Tönisberg on the way home, as mentioned before, and popped into Netto for some supplies for tomorrow and Monday (Easter Day and bank holiday Monday). 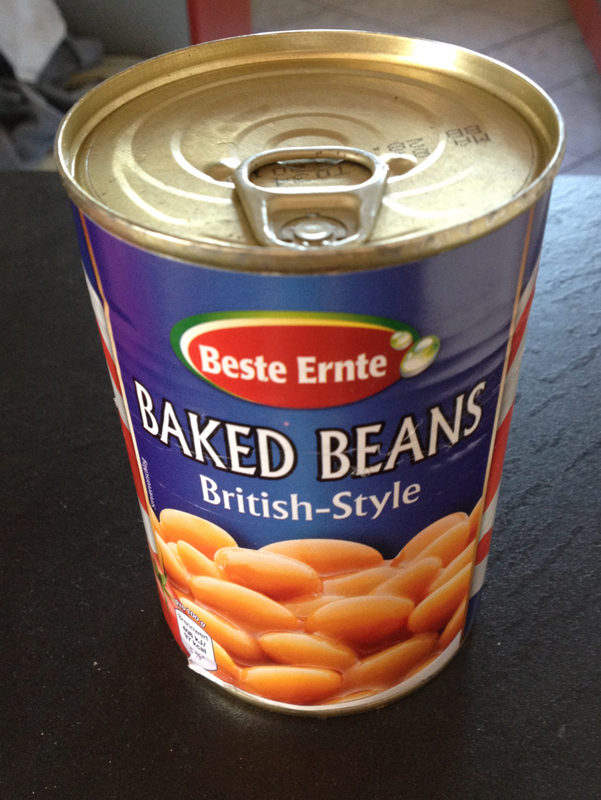 I spotted these baked beans and thought I’d give ’em a go! 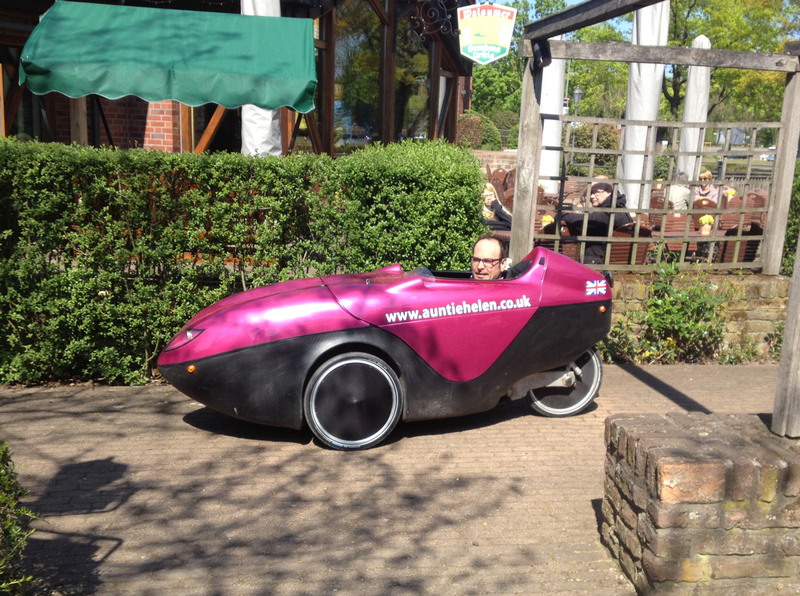 The great thing about a Velomobile is that you can buy a squishy cream/meringue cake, transport it five miles by bike and it gets home none the worse for the journey! The hill down from Tönisberg was great fun – I was on the road again and knew the layout of the road this time so zoomed down. At one point I noticed I was doing 52 kilometres per hour and the speed limit was 50! At the bottom is a crossroads but fortunately as I approached the traffic lights went green so I sailed across, still doing 40kph. This was fun! Rather than going onto the cycle path I thought I’d stick to the road as I had so much speed but I had a quick look in my mirrors and noticed a police car behind me. Oops! I indicated right, popped straight onto the cycle path (there was an access ramp at this point) and the police car sailed on, ignoring me. Best not to bait them though. I rolled into the driveway of my house at 4:30pm so the dog had had a fairly long day at home on her own but probably spent the entirety of it asleep. It was certainly good for me to stretch my legs and ride in a different direction for a change – I tend to avoid the north east as it’s a bit hillier. There were some interesting sights, though, so I’ll have to visit that part of the world again soon! I know those Germans like their asparagus, but I’d no idea they had special peelers! Even so, three of them seems a little excessive (unless you compare it to our collection of cheese graters). They have special cheese slicers too – I have one or two of those in my cutlery drawer here too!